Paralympian and polio survivor Ade Adepitan, TV presenters Konnie Huq and Julia Roberts, also a polio survivor, joined members of the public and Rotarians for a mass planting of 50,000 purple crocuses at Queen Elizabeth Olympic Park. The event was organised by Rotary to mark World Polio Day on 24th October 2017. The fountains outside the London Stadium were lit up purple to highlight the final push to rid the world of polio. We have never been closer to making history and eradicating only the second human disease ever with just 12 cases of wild poliovirus worldwide in 2017, seven in Afghanistan and five in Pakistan. 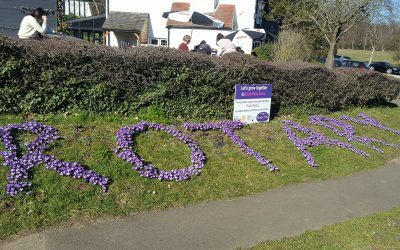 The activities at the Park aimed to raise awareness, funds and support Rotary International in Great Britain and Ireland’s Purple4Polio campaign. The Olympic Park Fountains weren’t the only thing glowing purple as dozens of iconic buildings were lit up by Rotary members across the country, including Canterbury Cathedral, the National Library of Wales and the Wills Memorial Building at the University of Bristol as well as holding other events. 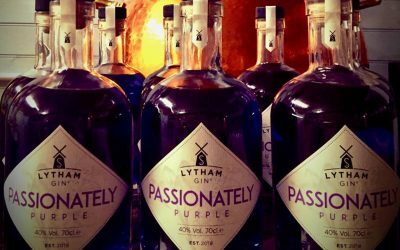 The campaign is so-called because purple is the colour of the dye placed on the little finger on the left hand of a child to show they have been immunised against polio. The groundwork laid by Rotary’s efforts to eradicate polio will have far reaching benefits, even after the world has been declared polio free, as Eve Conway, Vice-Chairman, End Polio Now: Countdown to History Campaign Committee reflected. Never heard of polio? Count yourself lucky. It has been eradicated from the UK and much of the world but pockets remain causing limb paralysis and threatening the lives of young children. 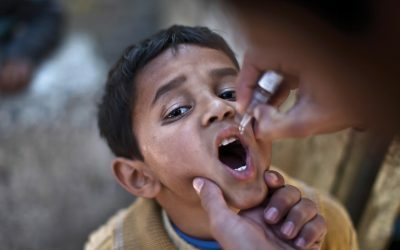 Through Rotary’s intervention with an intensive vaccination programme, which started in the 1980s and is backed by WHO, Centers for Disease Control & Prevention, UNICEF and more recently the Bill and Melinda Gates Foundation, millions of children’s lives have been spared from this crippling disease. Rotary International in Great Britain and Ireland has joined forces with the Royal Horticultural Society (RHS) to plant about five million purple crocus corms across Britain and Ireland, adding to seven million planted last year, as part of our Purple4Polio campaign to raise awareness and funds for End Polio Now. Rotary clubs are teaming up with RHS community-based Bloom Groups and other floral groups to plant the bulbs of their own in public spaces in local communities. Rotary International once again hosted a special live stream event on World Polio Day, this year coming live from the Bill & Melinda Gates Foundation HQ in Seattle. Thousands tuned in, but you can catch up with the stream below. Since Rotary and its partners launched the Global Polio Eradication Initiative nearly 30 years ago, the incidence of polio has plummeted by more than 99.99%, from about 350,000 cases a year in 125 countries to just 37 cases in three remaining polio-endemic countries, Afghanistan, Pakistan and Nigeria, in 2016 and just 12 cases of wild poliovirus so far in 2017. To sustain this progress and protect all children from polio, Rotary has committed to raising US$50 million per year over the next three years in support of global polio eradication efforts. The Bill & Melinda Gates Foundation will match Rotary’s commitment 2:1. Without full funding and political commitment, this paralysing disease could return to previously polio-free countries, putting children everywhere at risk. Rotary has contributed more than US$1.7 billion to ending polio since 1985. At the Rotary International Convention in Atlanta in June, world governments and other organisations joined Rotary and Bill Gates in pledging new money totaling $1.2 billion, towards filling the $1.5 billion gap in the funding that the Global Polio Eradication Initiative estimates is needed to achieve eradication. The British Government also pledged £100 million toward the fight to eradicate polio in August, to help vaccinate 45 million children per year by 2020.